BIKE SHOP is the story of a Brooklyn bicycle store and its owner, Bobby, an exuberant bike mechanic who runs a shop that was first opened by her grandmother is 1936. Fifteen years after a tragic bike accident, Bobby tries to get back on her bike and get her life in gear. When a former work friend, Frank (Chris Goffredo), returns from a tour in the Middle East, and comes into the shop for a tune up, Bobby must come to terms with the fact that she’s stuck, and life is passing her by. Elizabeth Barkan, a former Bike Store owner, builds and fixes real bicycles on the stage. Cyclists are encouraged to ride their bikes to the theater and park them on stage as a part of the set. The four person cast is backed up by a 4-piece “Bicycle Band”. 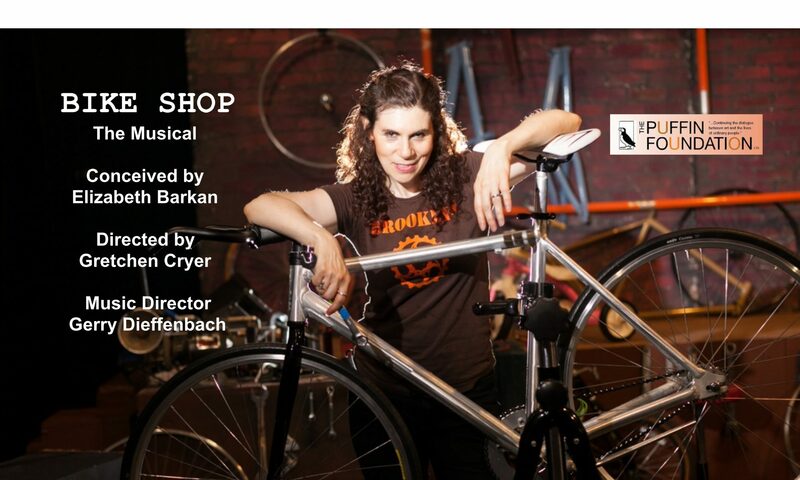 Theater for the New City produced BIKE SHOP, The Musical in 2015 as a solo show, starring Elizabeth Barkan, and directed by Gretchen Cryer. In 2013, Bike Shop was also produced in Part of Chashama’s Summer Performance Series. Bike Shop has now been expanded into a full musical with a four person cast.